Chi Beauty Artistry is operated by passionate beauticians who are continuously inspired by new techniques and trends. We are licensed Cosmetologists and trained by the most well-known names in the industry, such as Bobbi Brown, Laura Mercier, MAC, Joe Blasco, Paul Mitchell, Davines. Our mission is to bring your beauty from inside out, no matter what ethnicity you are. We don't do cookie cutter makeup or hair-dos. Every style we create starts with who you are not how you look. We not only want you to look your best, we want you to feel your best. We are experts in bridal and special occasion styling. It means the world to us when you choose our mobile bridal salon for your big day. We truly understand the stress you have been thru and the perfection you are looking for. Therefore, our pricing is upfront with no hidden fees. Want to be your own artist? 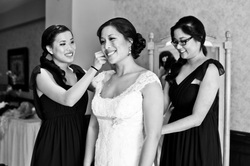 Be sure to inquire about a personal or group makeup lesson.